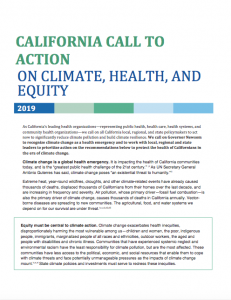 On Monday, January 14th over 30 health organizations sent Governor Newsom and key legislative members the California Call for Action on Climate, Health, and Equity (see below). The Call outlines critical priorities to advance climate action for health and health action for climate in California. To download the complete Call to Action and associated cover letter click here.